We have reconstructed the leading edge of a coronal mass ejection (CME) observed on 20 May 2007 by COR1 and COR2 of the SECCHI suite onboard the twin STEREO spacecraft. The reconstruction of the leading edge of this CME was achieved using the tie-pointing method based on epipolar geometry. The true speeds derived from the reconstruction of the leading edge were estimated. These estimated true speeds were compared with the projected plane-of-sky speeds of the leading edge of the CME derived from LASCO aboard SoHO as well as from STEREO A and B images individually. The results show that a better estimation of the true speed of the CME in the Sun – Earth direction is achieved from the 3D reconstruction and therefore has an important bearing on space weather prediction. Inhester, B.: 2006, Publ. Int. Space Sci. Inst. astro-ph/0612649, to appear. 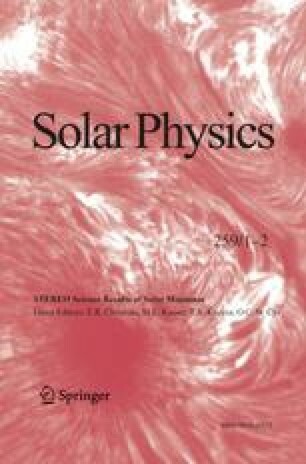 Mierla, M., Inhester, B., Marque, C., Rodriguez, L., Gissot, S., Zhukov, A., Berghmans, D., Davila, J.: 2009, Solar Phys., in press. doi: 10.1007/s11207-009-9416-8.